I think it’s great that you want to know a few facts about caffeine – many of our most popular beverages contain caffeine so it is important to know more about it. We all react differently to caffeine. Some people like me, experience a racing heart and jitteriness whereas some people remain relatively unaffected. If you consume a lot of caffeine, your body adapts and your tolerance level becomes quite high - so you end up needing more and more caffeine to have the desired effect. Thus begins a cycle. There are quite a few few harmful effects of caffeine that are worth taking note of. There are studies that show a moderate intake of caffeine to have a few health benefits, but these studies are not conclusive yet. The ideal is to have no more than 1 cup of tea or coffee a day or no more than 2 cups of green tea a day. Caffeine was discovered by Fredrich Runge, a German chemist in 1819. He was given a box of coffee beans by Johann Wolfgang von Goethe who asked Runge to analyse the beans. It was from these beans that the first pure caffeine sample was obtained. He coined the term Kaffein from which became Caffeine in English. Pure caffeine is a crystalline white powder. The full chemical name for caffeine is 1,3,7-trimethylzantihine. The lethal dose for caffeine is 10g. An average cup of coffee contains about 100mg of caffeine. Caffeine acts as a natural pesticide in some plants. It paralyses and kills certain insects that feed on them. Caffeine is found in 63 species of plants. Tea, coffee, cacao, yerba mate and guarana are the most commonly used plants. The world’s top source of caffeine is from the coffee bean. Coffee is brewed from these beans which is the seed of the coffee plant. 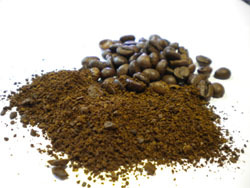 The two main varieties of coffee are Arabica and Robusta. The caffeine content in these beans varies – Robusta beans contain more caffeine than Arabica beans. Beans that are of a darker roast contain less caffeine than a lighter roast. This is because some of the caffeine is lost during the roasting process. Tea is another very popular caffeinated drink. Tea contains more caffeine than coffee, but a normal serving contains less because tea is usually brewed much weaker. The caffeine content in tea is also determined by growing conditions and how the tea is processed. A delicious and healthy caffeine-free alternative to black or green tea is rooibos tea which comes from South Africa. Caffeine is found in many popular soft drinks such as Coca-Cola which was originally made from kola nuts which come from the Central African rain forests. Energy drinks such as Red Bull are also very high in caffeine. Caffeine is a central nervous system stimulant that gives temporary alertness. Caffeine is a diuretic which means that it dehydrates the body. So you might need to go to the loo more frequently after consuming caffeine. Caffeine is addictive. As little as one small cup of coffee a day which contains about 100mg of coffee is enough to cause withdrawal symptoms. Caffeine makes you more stressed and tired. Caffeine addiction is very common - as little as 100mg of caffeine a day - which is about 1 small cup of coffee – is enough to cause withdrawal symptoms when we stop consuming caffeine. Chocolate also contains very small quantities of caffeine which comes from the cocoa beans used to make chocolate. If you have an enquiring mind like me, you will find it interesting to know how caffeine works – how does caffeine make us temporarily more alert? Please visit my “how does caffeine work?” page for an easy to understand explanation…it really is quite interesting. I do hope you found these facts about caffeine interesting and helpul in your quest for good health. If you have any questions or comments in relation to facts about caffeine, please contact me as I would love to hear from you.